I have about two more weeks to get ready for my solo show, Haven, that opens on June 1 at the Principle Gallery so I have little time to spare at the moment. 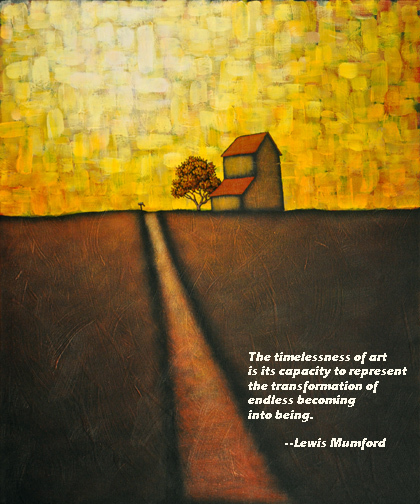 So excuse me for doing a little shorthand here by using an older painting (No Way Home from 2009) and a thought-provoking quote from the late historian Lewis Mumford. This idea of endless becoming transforming into being intrigues me, making me wonder if the work I am doing has made that jump. And how does one know? That might be both my breakfast and lunch because I’ll be chewing on it for quite some time today.